Starwood Hotels & Resorts, Inc. (NYSE:HOT) today announced that industry-innovator Westin Hotels & Resorts has partnered with FitStar™ by Fitbit ® to debut a series of fitness programs that are now available at many of the brand's 200 hotels around the world. In response to the growing global demand for wellness while traveling, this collaboration offers guests the opportunity to stay fit on the go, as well as take their workout beyond their hotel stay with complimentary trial access to the popular FitStar Personal Trainer app. 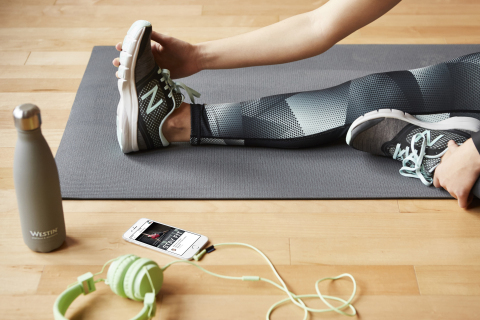 As part of this partnership, FitStar by Fitbit, together with Westin's National Running Concierge, Chris Heuisler, designed tailored Freestyle sessions with travel and small spaces in mind. The "Stay Fit with Westin" session, available now in the top-rated FitStar Personal Trainer app , features exercises like elbow planks, floor bridges, and alternating knee raises to help relieve common travelers' ailments - such as tight hips and lower backs - while building core strength and stretching tired limbs. The FitStar app includes bodyweight exercises and don't require equipment, making them perfect for people to do on the go. This partnership gives guests a complimentary 30-day trial to FitStar Premium, which includes unlimited personalized routines and access to all Freestyle sessions, including the brand new "Stay Fit with Westin" workout. "FitStar apps are ideal travel companions, offering fast, effective workouts that can be done anytime, anywhere," said Mike Maser, Co-Founder of FitStar by Fitbit. "FitStar is approachable because no matter what fitness level a user is - beginner or expert - it adapts to their ability and builds personalized sessions that progress with them, so it's achievable. It's easy to get off track while on the road, so we believe our partnership with Westin will help travelers around the world stick to their health and fitness goals." In addition to all hotel General Managers now wearing a Fitbit activity tracker, the brand boasts nearly 200 runWESTIN Concierges, who host group runs for guests and encourage runners of all levels to grab a running map with scenic routes through cities, along beachfronts and amid rural landscapes. For fitness traditionalists, WestinWORKOUT ® fitness studios feature the finest exercise equipment from world-class brands in open, airy and well-designed spaces. This partnership builds on Westin's global Well-Being Movement, an initiative dedicated to inspiring guests and associates to discover new approaches to wellness through innovative partnerships and programs across the brand's six pillars of well-being, including Move Well. For five years, Westin's Gear Lending program in partnership with New Balance ® remains an industry game-changer, allowing guests to pack light and stay fit with New Balance shoes and clothing for guests to use during their stay. Westin Hotels & Resorts, a leader in wellness and hospitality for more than a decade, lives its philosophy "For a Better You™" through the Westin Well-being Movement's six pillars: Feel Well, Work Well, Move Well, Eat Well, Sleep Well and Play Well. At more than 200 hotels and resorts in nearly 40 countries and territories, guests can experience offerings that include the iconic Heavenly® Bed, RunWESTIN™ and Westin Gear Lending with New Balance®, delicious and nutritious SuperFoodsRx™, the innovative workspace Tangent, Westin Weekend signature experiences, and Heavenly Bath and Heavenly Spa. Westin is proud to offer Starwood Preferred Guest®, the industry's leading loyalty program. To learn more, visit www.starwoodhotels.com/westin. Stay connected to Westin: @westin on Twitter and Instagram and facebook.com/Westin.